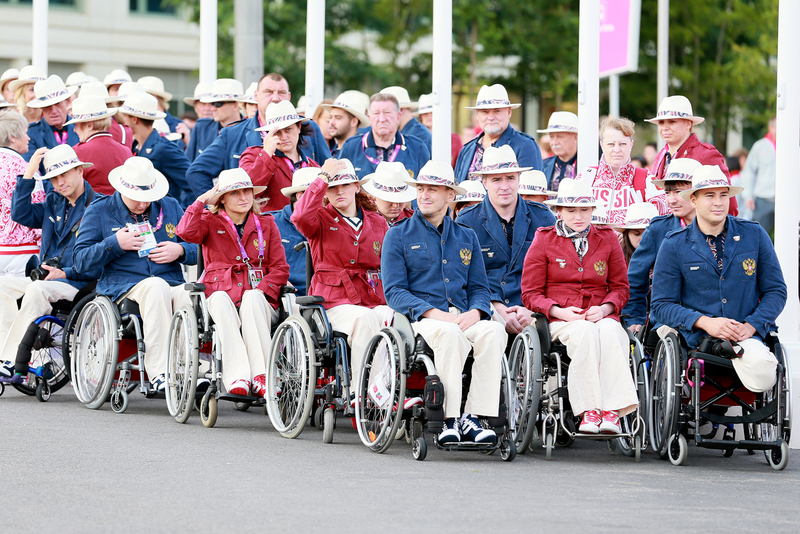 The Russian Paralympic team during the formal Russian flag raising ceremony in the Paralympic Village in London, 2012. Russian Paralympic athletes will not go to Rio, to the 2018 Winter Games in Pyeongchang and a number of other international competitions. Sports officials interviewed by RBTH were remarkably sanguine on the ban, with some observers even seeing a silver lining in the highly publicized scandal. The suspension of the Russian Paralympic Committee (RPC) by the International Paralympic Committee (IPC) following revelations that the former had been involved in a state-sponsored doping program automatically entails the suspension of Russian athletes from both the Paralympics and other international tournaments. But how seriously will it hit the Russian Paralympic movement in general? Rima Batalova, a 13-time Paralympic champion, the vice president of the RPC and a State Duma deputy, is calling on people not to exaggerate. She believes that it is still too early to talk about any serious consequences for Paralympic sports in Russia, because the organization will do everything possible for the earliest possible restoration of its former status. "I talked to [Sergei] Lavrov, the foreign minister has already commented on this situation, they got involved and will not sit idle," Batalova told RBTH. Sergei Shilov, a six-time Paralympic champion in cross-country skiing and a member of the RPC executive committee, is also not giving up on Paralympic sports in Russia. "I do not think that sports will be closed in Russia," Shilov told RBTH. "Children will continue to train and participate in competitions. I do not think this situation will last for a long time. In any case, we need to seek common ground with the International Paralympic Committee. We need to tell them more about our athletes, our system, so that it should all be open, because many do not know how we work." In addition to the 2016 Summer Games and Paralympics in Rio and the 2018 Winter Games in Pyeongchang, in the near future Russia’s disabled athletes will be barred from participation in a number of tournaments, including: the IPC Wheelchair Dance Sport World Cup in St. Petersburg and the European Para-Taekwondo Championships in Warsaw in September; the European B Goalball Championships in Maia, Portugal and the European Para-Badminton Championships in Beek, Netherlands in October; the IWAS Wheelchair Fencing World Cup in Pisa, Italy in November. Their future Paralympic fate will depend on in whose favor the RPC's main appeal is decided. This will be announced in the next six or seven months.The Russian national team's appeal was rejected by the Court of Arbitration for Sport in Lausanne, to be later dismissed by the Swiss Federal Court. More than 200 members of the Russian Paralympic team filed individual requests with the IPC for admission to the Paralympic Games, but 34 of them have already been rejected, which does not seem to give much hope for a positive decision for the other athletes. Alexander Shlychkov, the president of the European Para-Taekwondo Union, explains that involvement in sports is the most effective way of rehabilitation and social adaptation for Russian Paralympic athletes. This applies not only to professional athletes, but also to people who train at an amateur level. "Needless to say, the events of recent months were a serious test for each Paralympic athlete," Shlychkov told RBTH. "As for participation in the 2018 Paralympic Winter Games in Pyongyang, the question is still open. Now we need to build a dialogue with the IPC and respond to the allegations against the RPC correctly. And we can see that both athletes and the management are working hard on this." Shlychkov noted that against the background of recent events, interest in Paralympic sports has even grown in Russia, so it is impossible to talk about problems with its development and financing. "These kind of scandals and controversies are a waste of time and energy that the athletes could devote to training," Shlychkov said. "There may be people who will not cope with the emotional heat and leave the Paralympic movement, and these people cannot be blamed for this." President Vladimir Putin promised at a meeting with the Russian Olympic team in the Kremlin on Aug. 25 to hold special competitions for Paralympic athletes instead of the Paralympics. Athletes were promised to be rewarded for their successes in the same way as they would have been for their victories in Rio. The alternative competitions will be held in the Moscow Region on Sept. 7-8.